The next year was the first official Gen Con, which was held at Horticultural Hall. There were approximately 60 people in attendance at that event, including a high school student named Mike Carr who had convinced his family to spend their vacation sightseeing in the area. Carr attended that first Gen Con and shared his original board game Fight in the Skies. The game was eventually published by TSR as Dawn Patrol and it has been played at every Gen Con since 1968. 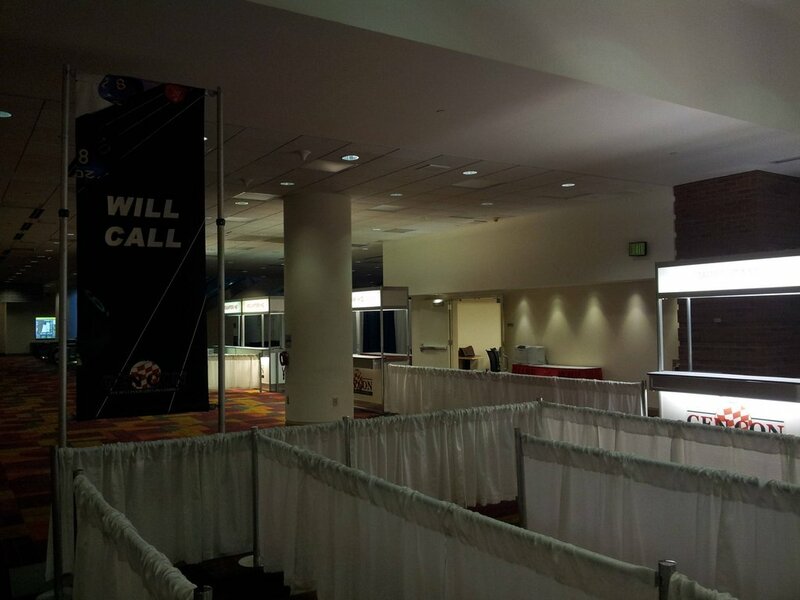 From those very humble beginnings Gen Con has become the premiere table top gaming event and one of the largest pop culture events in North America. 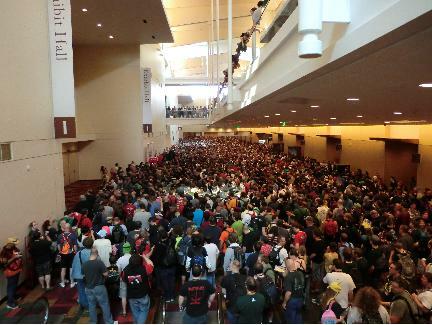 Last year Gen Con had over 41,000 attendees. There is a lot of fun to be had at Gen Con, but it can be a bit overwhelming so I’m here to give you a few tips that will help you maximize your fun and minimize your stress. Follow my advice and you’ll avoid being trapped in the Invasion of the Game Snatchers pictured above. Gen Con is one of the largest gaming conventions in the world. If you can’t find a game to play that is worth playing and that you have yet to play, then you aren’t looking very hard. I own quite a few games and I’ve played – though not rated on BGG – most of the games I own. I still find little gems to play at Gen Con every year. Sometimes the gems are new, but sometimes the games are classics that I had never tried before. There are a lot of new games and supplements coming out this year, but take some time to play a classic game. I’ll come back to this in a moment. 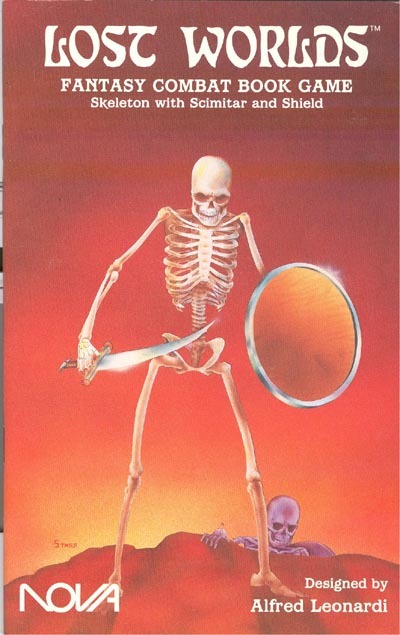 Have you ever played the Lost Worlds game books? Most grognards have, but if you’re new to the hobby they are a great way to pass the time. Gen Con always has a tournament or two going on somewhere. Some of these tournaments are organized and some are quite informal. If you’ve already played the Lost Worlds books, just keep looking. Maybe you can find someone running a session of Pathfinder Ponies in a room filled with Bronies. Do not. I repeat. Do not wait in line on any of the mornings of the convention to pick up your registration badge or tickets for events. The Will Call window is open all night. Yes, Indianapolis at night is a tad bit like an episode of The Walking Dead. It’s eerily quiet, and it feels like a zombie could jump around the corner to eat you at any minute. Don’t worry, though, because it isn’t a zombie, it’s a more than slightly drunk game designer staggering back to his or her hotel room after a night of “business meetings.” If your visit to the will-call window looks more like the Invasion of the Game Snatchers above and less like the creepy and still Night of the Comet set below, then you are doing it wrong. They instituted this policy last year and it was a big hit. Trust me. Take advantage of this perk. Gen Con may not be San Diego Comic Con when it comes to attendance, but the annual mayhem in San Diego could learn a thing or two from Gen Con. Having attendees register for events instead of waiting in the baking sun for some “kind soul” to leave Hall H is one of the things Gen Con does right, and yes, the tickets are often free. I know that you think I am kidding, but I’m not. If you want to read a trilogy of novels that are essentially an insider’s guide to Gen Con, then you absolutely must read these stories. 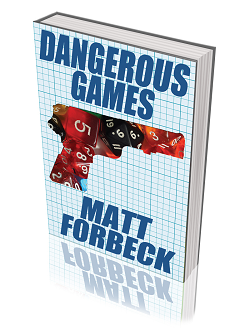 Dangerous Games is about a murder that takes place at Gen Con and in presenting the story, Matt Forbeck introduces you to the events and gaming celebrities you may meet at the convention. 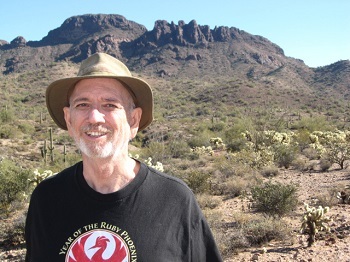 Do you want a glimpse at what hanging out with Ken Hite at the Diana Jones Awards is like? That’s in the first chapter. There is so much information packed into the omnibus that I have come to think of it as a vital visitor’s guide in addition to it being a rip-roaring tale. The reason the book is so useful is that Matt Forbeck is one of the hardest-working designers in the industry. He has worked everywhere and with almost everyone. He worked for Games Workshop in the UK for a while which is where he made many long lasting friendships and connections with British publishers; he has worked for TSR, Wizards of the Coast, and Pinnacle Entertainment group. In fact, those are only scratching the surface. You know the game “Six Degrees of Kevin Bacon?” In the gaming world, there’s the game “Three Degrees of Matt Forbeck.” If you’ve designed a game, you’re Matt Forbeck number is likely two. Name a game and we’ll see how few connections it takes. A few years back, I made a big mistake. I had the opportunity to meet Gary Gygax and I didn’t take it. I’ve regretted it ever since. Role playing gamers are lucky. Unlike a lot of hobbies and obsessions, the creators of our passion are still alive. No matter how hard you try, you can’t go to a tavern to ask Shakespeare what his inspiration for The Tempest was. You can play a game of Tunnels & Trolls with Ken St. Andre or a game of Dawn Patrol with Mike Carr, though, and it’s not that hard. Last year at Gen Con, I walked into the open gaming room where all the neophyte game designers are trying to solicit play testers. In the middle of this chaos was a sea of calm around a large table where all the participants seemed to be having a great time. I wandered over, only to find out that it was Mike Carr running Dawn Patrol. I want you to think about that for a second. There is only one event that has been played at every Gen Con since the first one at Horticultural Hall and that is a Dawn Patrol tournament. It’s a rare privilege. It’s also one that isn’t sufficiently taken advantage of by the attendees. Hordes of gamers will walk by this opportunity to learn about our hobby from someone who was there in order to walk over to a table on a scavenger hunt in the hopes of getting a Pathfinder button. And to not take the opportunity to play Tunnels & Trolls – the second role-playing game ever published – with its designer is a crime against the hobby. Whether you are a fan of the game’s mechanics or not, playing the game with Ken is a joy. It might even convince you to purchase a copy of the new edition they have coming out later this year. 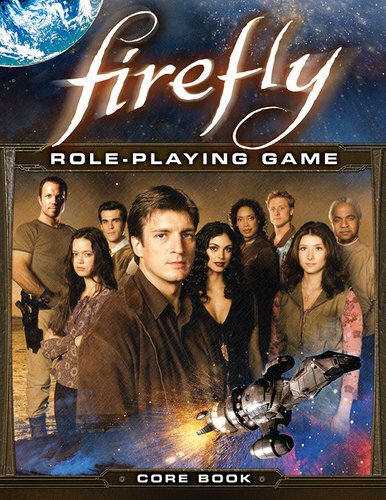 I guarantee you that there are some items that are going to be a number of Gen Con exclusive items…say for example the Firefly Roleplaying Game by Margaret Weis Productions. Let me tell you something. You can be friends with Amanda Valentine and Tony Lee, but if you didn’t preorder the game then there is no guarantee that you’ll be able to pick it up. I can also tell you that there are a lot of Browncoats and Whedon fans at Gen Con. So if you want a copy of Firefly pick it up on Friday at the latest because it probably won’t be there on Sunday. The same goes for any new RuneQuest books or any copies of Numenera that might turn up. That said, there are bargains to be had as the convention comes to a close on Sunday. All con long the folks at Troll and Toad have long boxes filled with gaming goodness. 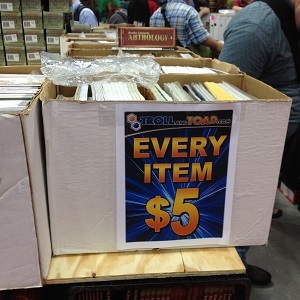 They start at “everything in the box is $15” and by the end of the convention everything in those boxes is being given away for pennies on the dollar. It’s not all d20 glut marginalia either. I managed to fill in some gaps in my World of Darkness line and found a copy of Whit Publications old WWF Wrestling Role Playing Game in those bins in prior years. There are some gems to be found on Sunday and you’ll need some time and money to figure it all out. The True Dungeon experience isn’t cheap, but it is well worth the price of admission. The designers of True Dungeon have built fantastic sets, hired actors, created special effects, and modified d20 game mechanics to provide an entertaining fantasy gaming experience. I’m not one of those who obsesses over the game, but there are those who do. This is because True Dungeon has a high replayability value due to engaging stories and collectable swag. People will venture again and again, or purchase scads of treasure tokens, in order to acquire rare magic items. This live action role playing game not only simulates old school dungeon crawling, it also entices players to become as greedy for gold as their fictional personae. This is the game I wanted to play when I first saw Tom Hanks in Mazes & Monsters. 7) Eat at One of the Themed Restaurants…Preferably The RAM. One of the best things about Gen Con is how the local businesses support the convention and buy into the experience by partnering with game publishers. This year Scotty’s Brewhouse is partnering with Paizo Publishing to become Pathfinder Tavern. Scotty’s will be redesigning their food menu with a Pathfinder theme to include such tasty treats as Poor Squealy Nord and Boggard Fingers, and thirsty adventurers will be able to wash down their meals with refreshing Pathfinder Dog Slicer Ale. The venue will also be decorated with a variety of Paizo banners and artwork, and a limited edition t-shirt will be available. The RAM restaurant, which has better food than Scotty’s (sorry Scotty), is once again teaming up with Privateer Press for a Privateer Press themed tap party Wednesday night to unveil Steelsoul Red! The Ram will be selling Steelsoul Red t-shirts, mugs, and growlers. 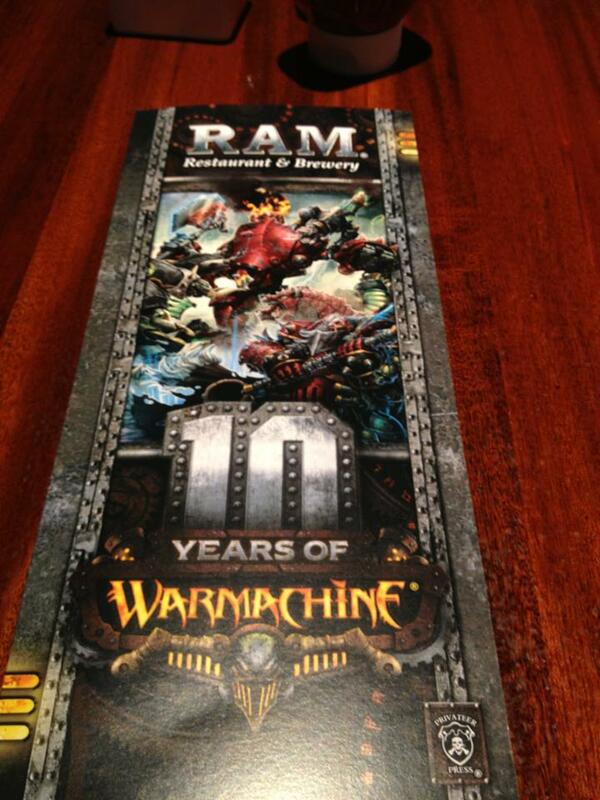 Stop by The Ram throughout Gen Con and enjoy the special Warmachine and Hordes atmosphere, menu, and swag! Eating at these themed restaurants is a fun experience, but I wouldn’t recommend doing it during traditional dining hours because the places get packed. Have an early lunch or dinner because if you are doing things right, you’ll be hanging out at one of the after parties with all the gaming celebs. If you walk up to your favorite game designer and immediately start telling him or her about your Forlorn Tremere and his struggle to maintain his humanity while tempted by the utility of blood magic and how awesome it was when he killed the progenitor of the Toreador bloodline…you are doing it wrong. Conversations with game designers are for one of three things. You can talk with a game designer to tell them how much you enjoyed their game without going into minute details about your specific game play. You can also talk with a game designer as a professional in the attempt to network. Finally you can talk with a game designer in an attempt to get that designer to run a game for you during the convention or to see if they are running a game that you can sign up for. Once you have signed up for their game, that’s when you immerse yourself in your character to the point of annoyance. Wait…scratch that. Still play in the game, but try not to do so to the point of annoyance. One thing to remember about attending a convention as an adult is that any time you are hanging out with a game designer or publisher is a moment when you are networking for a potential job. You may not want to become a game designer for a living, but it never hurts to have people in the industry who respect you when and if you decide to follow your muse. Even if you aren’t there to network and are only there to play with fellow gamers, it’s still not okay to spend 20 minutes talking about your character. Not only because it’s rude, but because it isn’t time well spent. Gamers tend to be nice people, and think about this for a second: if a fellow gamer is willing to listen to you talk about your character for 20 minutes, what is that really saying? Is it saying the gamer is interested in the character or that the gamer is interested in you as a person? Trust me when I say that it’s the latter. And if you are given you the opportunity to chat and make a new friend then take it. You never know when you’ll get a chance to play together. 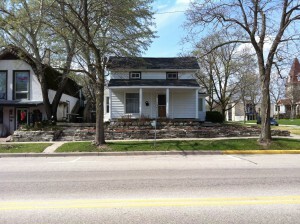 The housing block at Gen Con can be ridiculously expensive. Indianapolis is a city that sees a lot of big ticket events like the Indy 500, the Brickyard 400, Moto GP, college athletics, and Colts Fans. It is a city that can easily absorb 41,000 extra people without blinking. It’s a convention town. That said, it is a town that knows who is coming, and while gamers may not be wealthy those that are coming to Gen Con are not very price sensitive. This is especially true of the older set. The younger set stays 5 to a room and volunteer for the whole con under the illusion that this is fun. Some older attendees are there to buy rare items at the auction and have some money to burn. Both of these scenarios describe consumers who can pay a pretty penny for a room, and this drives up the prices in the downtown hotels. Many use the airport motels as an alternative to the downtown hotels, but that often requires renting a car or paying cab fare. By the time you do that, you’ve come part way toward paying the increased cost of the room rate. Fear not my friends, or do fear because it’s kind of reasonable to do so, because there is an alternative and it is murdermenow.com…I mean AirBnB.com. If you check the site today you won’t find much that is affordable, but if you check the site for next year’s event you will. In fact, you might even be able to rent a house that you can share with a couple of friends with each of you getting your own room. The house might have a kitchen which will save on food and will provide a place for you and your friends to play those new games you bought. Some people may feel uncomfortable spending the night in a stranger’s home, and I’m sure that we will see a couple of horror movies in the near future about this trend, but I have found Airbnb to be one of the best kept secrets of the interwebs. Whether you go to GenCon solely to play games or to play games and network, it is one of the most exciting conventions around. There are seminars on game design and writing fiction, award ceremonies, costume contests, and more games being played than you will probably ever see at any other location. It’s truly wonderful. I tend to go to network and meet up with podcast guests and friends in the hopes of becoming a game-design celebrity myself. But you know what they say about professional game designers and extra-large pizzas right? At least a pizza can feed a family of four.